I think they may be a bit to full in the front rise, although it's hard to tell from the pic. A semi-tuck might provide a little structure to the volume. I do love you in wide legs! I still like last week's look best but this looks good too. I'd like to see more of a color contrast between jacket and trousers on this. You can tell that they don't match but it might need to be more deliberate, or it may just be the lighting of the photo. I love you in the skinnies but (full disclosure) I pretty much struggle with wide legs. These particular widelegs may need to be replaced, but OMG, you can rock this silhouette! LOVE this look. I think they may be a little too wide but I also think you really suit this look. This one and the skinnies from last week are both awesome and, to me, you've absolutely nailed your business casual style!!! And I too think your assistant is gorgeous. I think you look good in wide-legs. Maybe not these particular ones, but I think you can carry the look. Absolutely you can carry the look. Very elegant. Try Beth Ann's idea of semi tucking that top. I really like the overall look and the cool print on the top, but I do agree that the pants might be too big. Absolutely love the second outfit! Joining the chorus Amy regarding a bit of a semi-tuck just to break up the line. Those pants are PPL!!! Your skinnies look like the perfect outfit for a Friday, while those wide legs suit the beginning of the week. Your arm candy is so handsome! I think a tuck or semi-tuck on the top would make this better with a belt showing for structure. Wide legs are great on you, but I agree these may be just a tad big in the upper part. I love your patterned top in today's outfit! I guess I'm not that good at fit issues because the pants look fine to me. I like last week's outfit also. I missed your post but think you look great. I also think the wide legs look very elegant and perfect for business. #3 is perfect on you! Wide leg pants really suit you, amiable! Loving that patterned top! Are you bold enough to try a pointy or almond toe shoe with these pants? I can't speak to the size- it also depends on the fabric and how you like to wear them eg fitted over thighs or loose all over. This looks great. I think you've found the solution to the black blazer, grey trousers problem - a great, bridging shirt. I have to try it. Faving this thread right now. 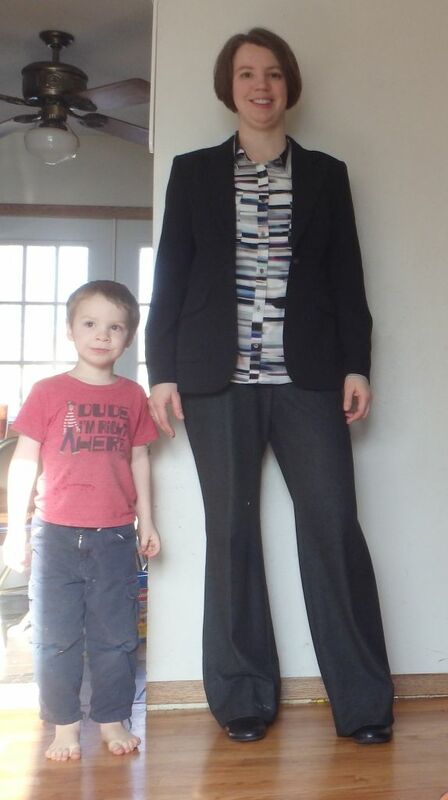 Thanks Rachy - I was hoping the black-blazer and gray trousers wouldn't look too awkward together. Wow! Amiable, you look so fantastic and I think the little agrees, too! Both looks are spot-on and I wouldn't change a thing. You really can wear the wide leg trousers well and it's still a work-in-progress for me so I'm taking notes here. Wow Amy! So great! Your height works great w/ those pants! Your little guy is super adorable--and your twin!